I was up by 6a on the second day of a desert road trip. I was parked off the Excelsior Mine Rd north of Interstate 15, less than 20mi from the Nevada border. I was in the area to tag some lesser known desert summits, a few obscurities that appear in Zdon's Desert Summits. This standalone mountain lies between the range and valley that share the same name, though oddly it is not considered part of the range. A sandy powerline road passing to the south of Shadow Mtn allows just about any vehicle to get within a few miles of the peak. A rougher road forks off and can be used by high clearance vehicles to get much closer as described by Zdon, but I managed less than a quarter mile up this road. A 2.5mi approach would have to do for me. The hike/climb has little to recommend it other than a nice little walk. There are no difficulties encountered in climbing this peak from any direction as it seems to be a rounded pile of sand and stone, sparsely vegetated. I followed the old mining road towards the summit until I lost it somewhere among the wash channels. I climbed the peak via the SE Ridge, making it to the summit in just under an hour. John Vitz had left an undated register somewhere around 2000 with about a dozen parties visiting since then. A USGS benchmark dates to 1955. I dropped west and southwest off the summit finding a prospect along the ridge and a more serious mining endeavor lower down. A mineshaft was sunk almost straight down for several stories with aluminum ladders leading down into the darkness. I wasn't about to trust them for an exploration no matter how solid they appeared. Nearby was a doorway to a living chamber dug into the alluvial debris that forms a hillside - spartan living at its finest. I picked up the road leading back at this point (spying this from above was what prompted my descent off this side) and half an hour later I was back at the van, the whole outing taking less than two hours. I drove back out to Excelsior Mine Rd and continued north to the junction with Kingston Rd. Whereas the left fork (Excelsior Mine Rd) heads across the Kingston Range, the Kingston Rd heads northeast across the Mesquite Range and into Mesquite Valley and Nevada. Though dirt, Kingston Rd is well-maintained and a breeze to drive on. I drove up this road about 4mi, half the distance to Winters Pass, and parked. I would use this as a starting point for a tour of the southern half of the Mesquite Mountains. 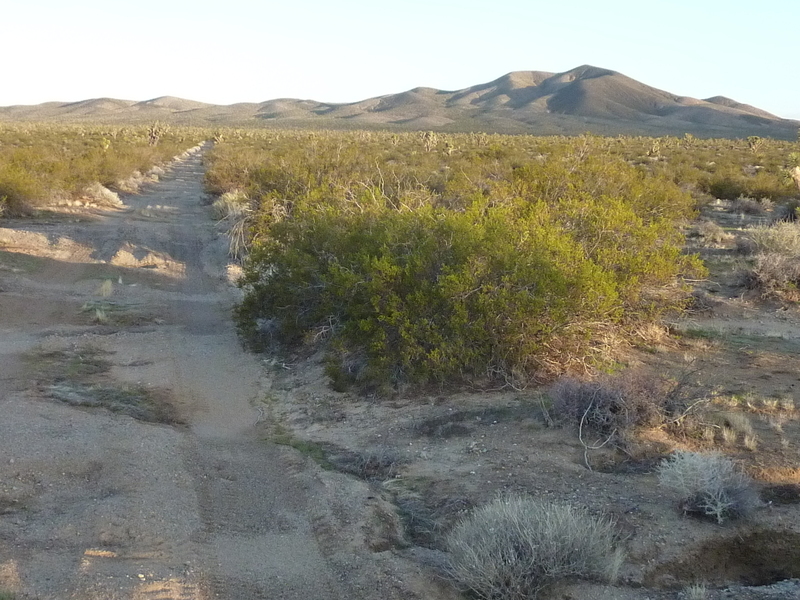 This was one of those outings where having a low clearance vehicle offered no handicap - the entire stretch of the range southeast of the road is designated as the Mesquite Wilderness, so there would be no way to drive closer. My main target was the highpoint of the range, Mesquite Mountain, but I planned a large loop that would take in a handful of bonus peaks within the range. From the van, I headed SE, crossing several miles of desert flats in order to reach the base of the range north of Bull BM. This 5,000-foot summit with 700ft of prominence lies 2mi SW of the range highpoint, not exactly "on the way", but a worthy enough bonus peak to go through the extra effort. It is the southernmost summit in the range, anchoring it before the terrain drops in elevation to Mesquite Pass. It took an hour and 40min to reach the summit over easy class 2 terrain. In addition to the expected benchmark, there was a 1984 MacLeod register with only half a dozen entries since then and only two since 1994. From the summit I headed down the east side, dropping all 700ft of Bull BM's prominence to a saddle with the main north-south trending crest. The rock changes to predominantly limestone on the main crest which makes for a more enjoyable climb. The sharp nature of its edges makes it easier to climb at steep angles and even the broken talus pieces are more apt to provide solid footing as compared to volcanic or granitic rocks. From the saddle I regained all of the 700ft and then some, passing over a false summit before finally reaching the range highpoint shortly after noon. Gordon had left a register here on the same day in April that he'd visited Bull BM. Evidently I was following in his footsteps more closely than I would have guessed. The summit offers a fine view looking east, eight miles across the broad Mesquite Valley straddling the CA/NV border. Across the valley rises the southern end of the Spring Mountains where I would be heading the next day. To the south rises the snowy Clark Range rising to nearly 8,000ft. My looping route would continue north along the crest, tagging three additional bonus peaks, each about 100ft lower than the previous. The highest of these was Peak 5,114ft, also the most interesting with some nice scrambling on the way to its summit. The limestone continues along the length of the crest which helped make this highly enjoyable. It would take about half an hour between summits and it was nearly 2p by the time I found my way to the last of these, Peak 4,895ft. Tucked away in the summit rocks was a small film cannister holding an Andy Smakto register from 1983. There had been no other signatures in 32yrs, but this may have had more to do with how well it was hidden than from how few people pay it a visit. From this last summit my route turned WSW, my van lying some 1,400ft below and three miles in that direction. One of the coolest sights I saw on this road trip was as I was descending. I startled two bighorn rams that took off once they recognized me as something undesireable. I fumbled with my camera to get a picture before they were out of sight, just managing to capture them in a blurry image. It's not often I get to see them, and judging by some of the register entries, that's the usual experience. I had better luck taking a picture of a butterfly that was kind enough to sit still for me, one fo the first I had seen this season in the desert. It was a leisurely descent because I had plenty of daylight left and didn't want to see this enjoyable venture end. It was a fine time to be in the desert.